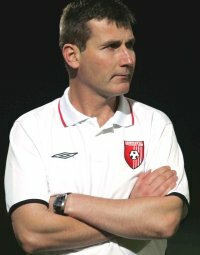 STEPHEN Kenny today quit as Derry City manager – planning to move with his wife and children back to Dublin from his home in Inishowen. His move to the job at Shamrock Rovers has been mooted for several days with Michael O’Neill landing the job as manager of the North. And Kenny took Christmas Eve to make his announcement. He is said to be very upset. His wife and children are said to love living in Donegal. Kenny met with the Derry chairman Philip O’Doherty today to confirm that he was quitting the club. “I met him this morning at 9.45 and his first words were ‘It’s time to go home’,” Derry chairman Mr O’Doherty told BBC Radio Foyle. “It’s very sad and Stephen was quite emotional himself. The Derry chairman acknowledged that Kenny’s departure was a “very bad Christmas present”. “It took him a long time to make a dcision and I suppose that’s testimony to how close he was to the people of Derry. “But when the Michael O’Neill thing started to take place, we all suspected that there would be an approach. “It’s very disappointing but I can understand it too. Neighbours and Derry City fans in Inishowen say they will not part on bitter terms.